New Delhi, April 10 (IANS) Hitting out at Rahul Gandhi, Defence Minister Nirmala Sitharaman on Wednesday said the Supreme Court's ruling on the Rafale issue is not a setback for the government and alleged that the Congress President has not only misinterpreted the court's verdict but also indulged in contempt of court by attributing words to the apex court which were not in the judgement. In a scathing attack on Gandhi and his party, she said: "We all know Congress President probably doesn't read even half a paragraph, but by saying that the court has accepted that there is some corruption in the deal, and by also saying that the court has said 'chowkidaar chor hai'...these verge on contempt of court." She said the president of a party which ruled the country for so long has "completely shown his frustration by attributing words which were not said by the court". "Has court said anything to this effect? It is (not) gross contempt of the court?" Sitharaman said at a press conference. 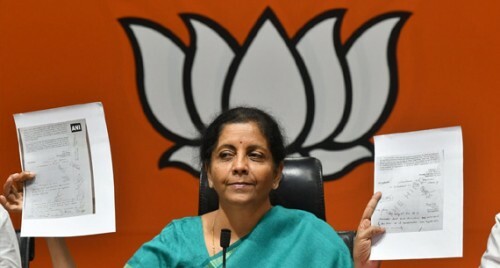 Asked what legal action the Bharatiya Janata Party (BJP) or the government is going to take against Gandhi, Sitharaman said: "Dekhte hain... (we shall see)." Asked whether court's judgement is a setback, she said: "Not at all. 'Sab dudh ka dudh aur pani ka pani ho jayega. Congress muh dikhane layak nahi rahegi (everything would be clear soon and Congress would be embarrassed)." Her remarks came after the Congress President welcomed the Supreme Court order to review the Rafale deal on merits and said that the Supreme Court "had accepted that there is some corruption in the deal". Launching a direct attack on Modi, the Congress leader said the apex court order had made it clear that the watchman (Modi) allowed the theft to happen.